This is the complete package! 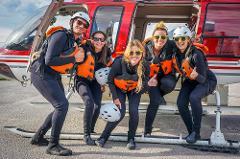 If you're looking to raft a full day, take a ride in a helicopter and experience the best of the Kicking Horse River this is the trip for you. 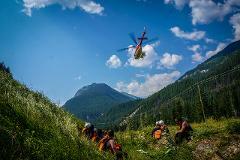 The middle and lower canyons - the 2 biggest sections of white water on the Kicking Horse River - plus a heli ride to get there. Enough said! Half floating, half big white water in the upper and middle canyons. 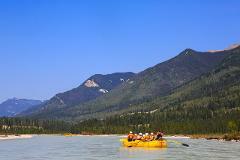 If you're looking for Rocky Mountain scenery and some boat swamping rapids, this is the perfect balance. 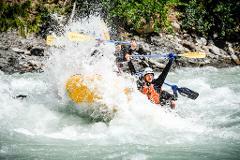 The middle canyon of the Kicking Horse River - a quick trips with lots of great class 3 and class 4 whitewater. Are you feeling a bit nervous about hopping in a raft, travelling with young children, or just want to sit back and relax? This is the trip for you. White Water Express - 3:30 p.m. 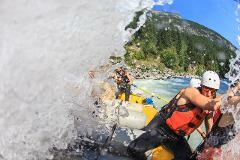 The middle canyon of the Kicking Horse River starting at 3:30 - a quick afternoon trip with lots of great class 3 and class 4 whitewater. 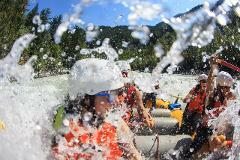 High water on the Kicking Horse River is definitely something to experience. We raft the middle canyon twice at high water because this is as big as it gets! Only available in June.